Lydia Scalf, daughter of John Scalf, Sr. and Edeah (Edy) Carlisle Scalf was born 1803-1808, depending on which census record one reads. Lydia married Johnson Painter, sometime around 1820 – 1825. Johnson and Lydia (Scalf) Painter were the parents of two girls by the enumeration of the 1830 Washington County, Tennessee census. It is listed in other manuscripts found on the Internet that there were five children of Johnson and Lydia; however, we are unable to confirm this information. Martha Jane (Painter) Hurley and Mary (Painter) Vaughn appear to be the daughters listed on the 1830 census. Some researchers believe that Lydia and Johnson had a daughter named Rebecca as well but no proof has been forthcoming. Their son, John, had not been born by 1830 but does appear with Lydia on the 1850 census with an estimation of his birth date as 1836. John was not found after 1850. The census records of 1830 suggest that Martha was born before 1830 and her death record submitted by Brenda Kennedy confirms that Martha was in fact born 1828. According to the 1850 census, Betty Painter was born about 1830. The births of these daughters certainly reveal that Johnson and Lydia were married before 1828 but a marriage record for this couple has not been found. We find Johnson Painter as head of house on the 1830 Washington County, Tennessee census listed below. A son, John W. Painter, was born to Johnson and Lydia around 1836 according to the 1850 census and appears to be the last child of Johnson and Lydia. However, we have not found Lydia or Johnson as head of house in 1840; therefore, we cannot be certain of this. It is believed that Johnson died after the birth of John W. Painter, possibly between 1836 and 1840 but certainly by 1844. Lydia (Scalf) Painter can be placed in Hawkins County, Tennessee as head of house as early as 1844 for a school census record was taken during the years 1838 – 1869 listing her as head of house. This school census shows Lydia as head of house in the years 1844 and 1845, as well as the approximate area where she lived. Johnson did not appear as head of house in 1850 but Lydia was again found as head of house on the 1850 Hancock County, Tennessee census. The fact that Lydia was head of house in 1844 suggests that Johnson died 1835 – 1844. Whether there were other children after the birth of son John is unknown to this writer but it is possible. However, no other children appear on the 1850 census of Hancock County younger than John. The name “Painter” was often found as “Panther” in Hancock County, Tennessee and Panter in other areas. A Trent researcher, Sharon Carter, provided the school census listed below. “A kind of "school census" was made of parents and school age children living in District 2 of Hawkins/Hancock Co., TN between 1838 and 1869. The school commissioners called this "a report of the scholastic population" and it was passed down every year to the new commissioners. The original copy, entitled "Squire's Ledger", is owned by Warren Yount. Last summer, Karen Hedrick of Vale, S.D., made copies of this ledger while she was on vacation and I am so grateful to her, both for doing that, and for making copies available to others. According to the front of this booklet, the scholastic population listed was from families living in the Cool Branch and War Ridge communities of Hawkins/Hancock Counties. I will include all of the Trents and Scalfs listed, as well as some of the other surnames and some of the districting and other comments made by the school commissioners.” (Sharon Carter). "Squire's Ledger for Cool Branch and War Ridge Communities of Hawkins and Hancock Counties, Tennessee Containing parents and school age children 1838-1869 from original copy owned by Warren Yount"
The number (4) following Lydia’s name was probably intended to indicate the section where Lydia lived and not the number of children in school. If this is correct, Lydia lived somewhere around War Ridge in the Valley between War Ridge and Clinch Mountain or Bucklick Gap. 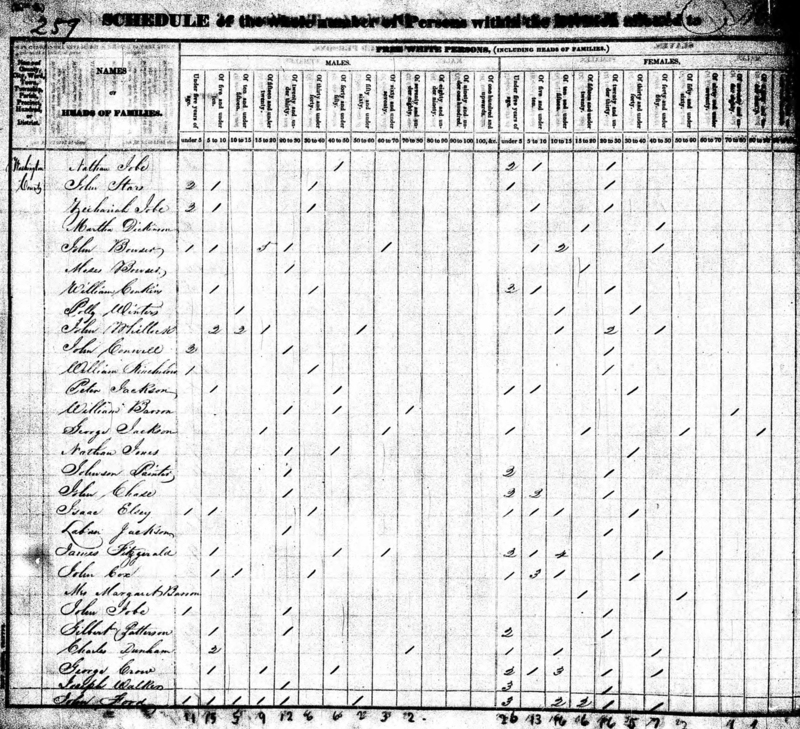 Lydia was not found on this school census after 1845, which could have meant she either had moved or that she no longer had school-age children. There is a Martha Panther also listed in the school population census of 1847 in Hancock County. We have no information as to who this Martha Panther was but we believe she was the wife of another Painter family member. A Nehemiah Hurley was also living in the area where Lydia Painter was found on the 1847 School Census. William Scalf who married Talitha Scalf was also a neighbor to Lydia in 1847. It should be noted as well that these records were typed copies from the original and there could be errors in these numbers though not intentional. Review of the original document should always be undertaken to confirm information, and especially with transcribed copies. By 1850, Lydia is found as head of house on the 1850 Hancock County, Tennessee census with her son John listed as age 14. This census estimates a birth date for John of 1836. John would have been required to attend school by today’s standards, but this was not required in 1850. He would have been considered “the man of the house” working the farm or whatever was needed for the family’s survival. By 1860, we find Lydia living in the home of Larkin Stapleton in Hawkins County, TN. The relationship of Lydia to Larkin (if any) is unknown at this time but Larkin’s wife is believed by some researchers to have been a daughter of Lydia. If Sarah Stapleton were a daughter of Lydia and Johnson, she would have been the last child born instead of John W. Painter due to her age. Sarah Larkin was born around 1842. We have no supporting evidence to confirm or deny that she was related to Lydia and Johnson in any way. Her son John was not found and would have been about 24 years old and likely married if he had not died. 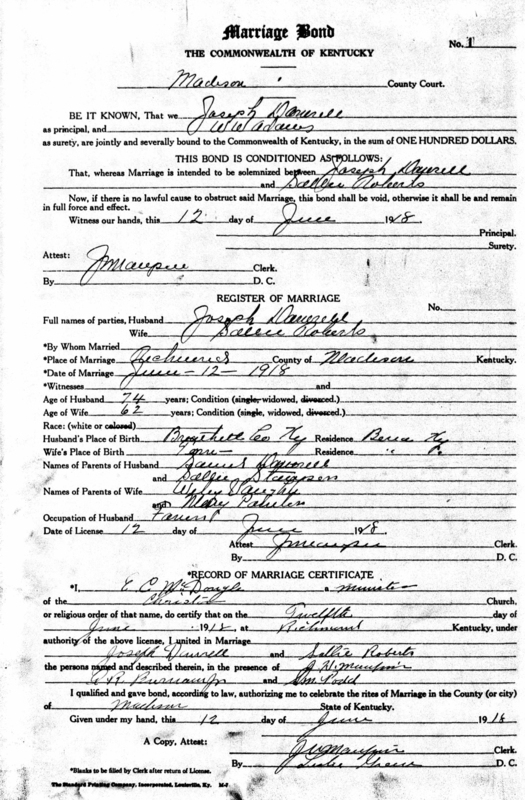 Marriages Records 1789 – 1866 of Hawkins County, TN state that Larkin Stapleton married Elizabeth Frazier March 10, 1854. His wife on the 1860 census was Sarah E. which could be Sarah Elizabeth Frazier; however, the same marriage book states that Larkin Stapleton married Sarah Cooke July 31, 1856, just two years later suggesting that Elizabeth died and Larkin remarried to Sarah Cooke. Sarah Cooke Larkin is probably the wife on the 1860 census and may or may not have been a relative of Lydia. A Hurley-Cook connection is not known at this time. One researcher states that Sarah Larkin was a granddaughter of Lydia but we have no confirmation on this information. By 1870, Lydia again cannot be found. It is unknown where she might have been living at this time but was likely living with a family member and possibly in Kentucky although the Kentucky census records have been searched extensively with no results. We suspect Lydia was living with someone unknown to us as she was in 1860 when she was found with the Stapleton family. 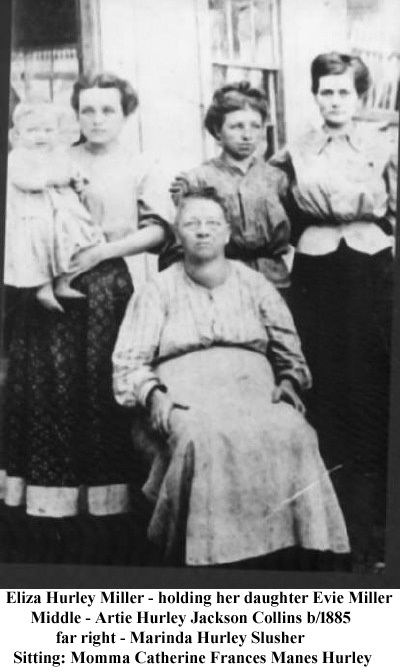 Lydia is then found in 1880 back in Hancock County living in the home of her grandson, Francis Asbury Hurley, the son of Nehemiah and Martha (Painter) Hurley. Lydia was not found after the 1880 census of Hancock County, Tennessee and most likely died 1880-1900 in Hancock County, Tennessee. She was listed as 72 years old in 1880 but was probably closer to 75. Early Virginia tax lists show that at least one Painter family traveled through Russell County, Virginia where the Scalf family was living. Joseph Painter was a resident in Russell County by 1790. Whether Joseph was related to Johnson Painter is not known at this time. In the year 1758, in the Shenandoah Valley, Indians captured the wife of one George Painter and several sons, along with several of his daughters when they plundered and burned his home. George was killed and Indians carried off several sons and daughters as well. Adam, a son of George Painter, and Adam’s brother returned home with their mother three years later but three of Adam’s sisters remained with the tribe. One daughter, Mary eventually returned but two of the daughters never returned. It is unknown at this point if there was any relationship between George Painter’s family of the Shenandoah Valley to Johnson Painter of Washington County, Tennessee or Joseph Painter of Russell County, Virginia. Lydia Scalf was certainly living in Russell County with her parents in 1820 and her parents were there in 1830 but Lydia had moved to Washington County, Tennessee where a number of Painter families were living. We suspect that Johnson and Lydia might have married in Russell County, Virginia, as the custom was that marriage took place in the bride’s county; however, no marriage record has been found in either Russell County, Virginia or Washington County, Tennessee. A search of the East Tennessee and Southwest Virginia marriages have not revealed a marriage record for Lydia and Johnson but the marriage record might not have survived the Civil War. Many of the early Tennessee and Virginia marriages have been lost or destroyed due to the burnings of courthouses during the Civil War and at other times along with flooded basements, etc. We believe that Lydia was born in Wilkes Co. North Carolina if she was born before 1806 but Lydia states that she was born in Tennessee on one record, Virginia on another and on the last record found of Lydia, she states North Carolina. Her father left Surry County, North Carolina around 1806. As with other family members, Lydia’s age varies from census to census. John W. Painter, son of Johnson and Lydia, was not found as head of house on a census record and this suggests he might have died by (or before) 1860. John would have been around 24 years old in 1860 and old enough to be married but he was last found on the 1850 census with his mother, Lydia. Lydia is then living with the Stapleton family in 1860 and John was not found. It is reported in some genealogies that John W. Painter married Emily Grigsby in Washington, Carter, or Greene County, Tennessee; however, we have been unable to confirm that this was the son of Johnson and Lydia (Scalf) Painter. Martha Jane Painter, daughter of Johnson Painter and Lydia Scalf married Nehemiah “Buck” Hurley. We do not have a marriage record for Nehemiah and Martha at this time. Although it cannot be stated with certainty, records suggest that Nehemiah “Buck” Hurley was a son of Nehemiah Hurley listed on the tax list of 1811 in Hawkins County, Tennessee. This Nehemiah was next found on the 1830 Hawkins County census with a family of five boys and one girl. A copied deed in the possession of Brenda Kennedy, a descendent of this line reveals that Nehemiah purchased land from one, ____Nichols in 1832 but lateral sold the land. In 1836 Nehemiah Hurley issued a deed of land and Grist Mill to Paul Bunch. We believe this to have been the older Nehemiah because Nehemiah “Buck” Hurley would likely have not been old enough to own land at that time. This land and Grist Mill was then sold by Paul Bunch to William Trent and Nehemiah was found in Harlan Co. Kentucky by 1840 suggesting he left the Hawkins/Hancock County area 1836 – 1839 after the sell of the Grist Mill. A daughter was born in Tennessee in 1839 and the next child in Kentucky. Nehemiah Sr. made his way back to Hancock County, Tennessee by 1850 where he and his wife were found on the 1850 - 1870 census records. Nehemiah (the elder) and his wife Lydia were still living in Hancock County in 1870; he at the age of 81 and she at the age of 76. Neither Nehemiah nor his wife Lydia were found after this census. Francis Asbury Hurley, son of Nehemiah “Buck” Hurley and Martha (Painter) Hurley and possible grandson of Nehemiah (the elder) and Lydia, was listed on the 1880 Hancock County, Tennessee census with his occupation as “Grist Mill Operator.” We cannot confirm that the Grist Mill was the same Mill that Nehemiah (the elder) previously owned and sold to Paul Bunch. Nehemiah “Buck” Hurley and Martha (Painter) Hurley appear on the 1860 Hawkins Co. TN census but Nehemiah “Buck” was not found with Martha after this census. The death certificate of Martha Jane (Painter) Hurley was contributed by Brenda Kennedy. According to her death certificate, Martha Jane (Painter) Hurley was born October 13, 1828 in Virginia and was living at Four Mile Creek in Rim (Bell County) Kentucky at the time of her death January 25, 1911. She was 83 years, 12 months and 3 days old. Martha was listed as a widow. Her father’s name is listed as Johnson Paynter on her death certificate and her mother is listed as Lydia Scalf. 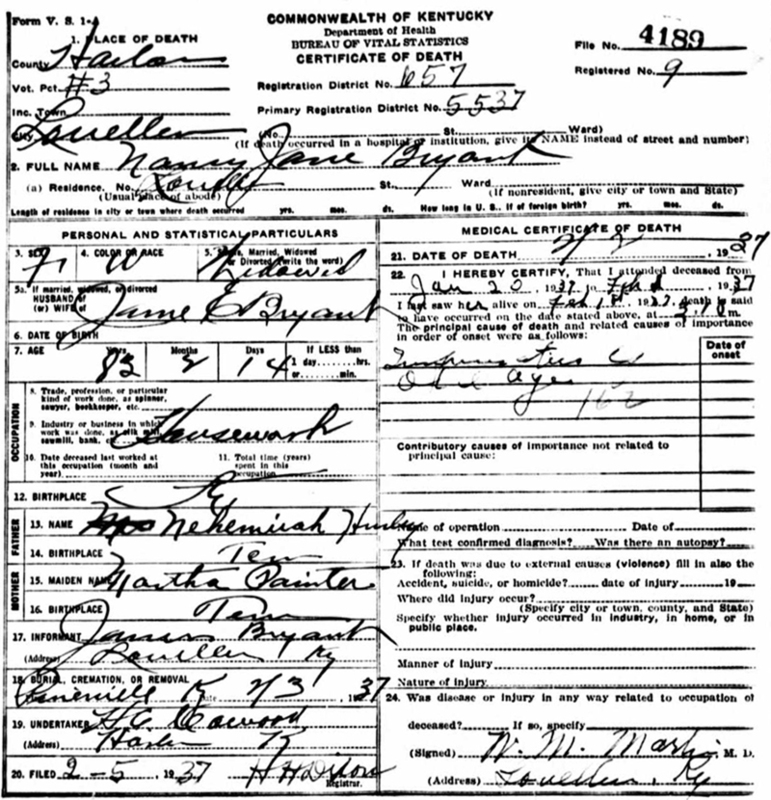 The death certificate states that Johnson was born in Virginia and her mother in Tennessee. Martha’s daughter, Nancy J. (Hurley) Bryant, was the informant for this record. Martha Jane (Painter) Hurley died of heart failure and is buried in Wallsend, Kentucky. If the birth date is correct on the death certificate of Martha Jane (Painter) Hurley, then she might very well have been the oldest child of Johnson and Lydia. It is unknown what might have happened to Nehemiah “Buck” Hurley after the 1860 census but the 1870 census shows that Melvin was the last child born to this couple, unless there were children born and died before 1870. The influenza and cholera epidemic that was rampant in the area during the 1850’s might have still being lingering in the 1860’s and Buck might have died from one of these diseases. It is also possible that Buck was killed during the Civil War either as a soldier or simply killed by marauders or bushwhackers. The Lee Valley area was a hotbed during the Civil War and several murders took place here. In 1870 Martha (Painter) Hurley is living as head of house in Hancock County, Tennessee near other relatives. The ages are off on the children according to the previous census. Martha’s son, Francis Asbury Hurley, had married and was living next door to his mother. Hurley researchers state that Martha moved to Kentucky to live with her daughter, Nancy, after Nancy’s marriage. 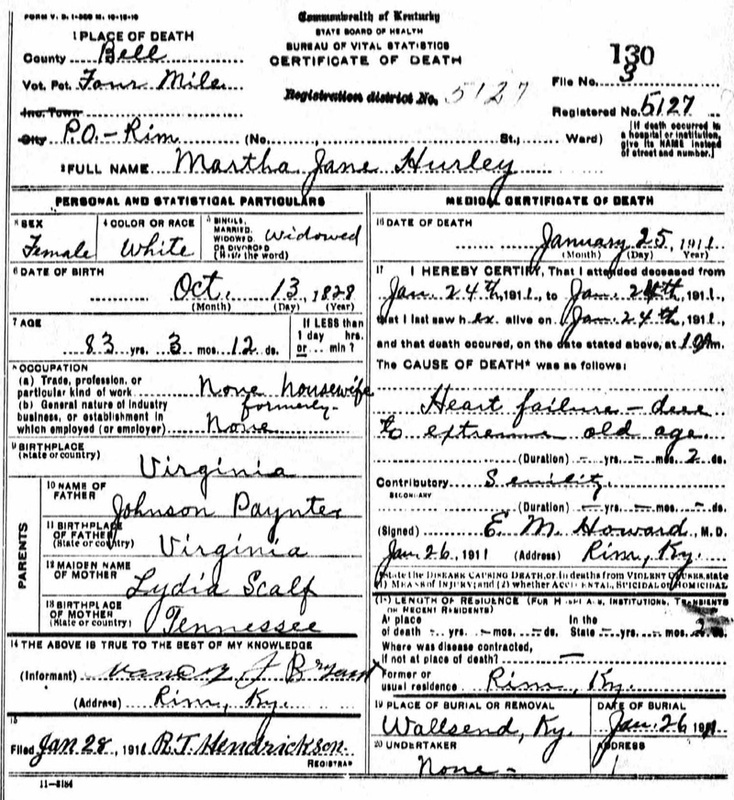 Martha Jane (Painter) Hurley was not found again on the census records until 1910 in Bell County, Kentucky where she was living with her daughter, Nancy (Hurley) Bryant and family. Frances Asbury Hurley was born 1847 – 1849 according to census records. He was the son of Martha Jane Painter and Nehemiah “Buck” Hurley. Francis was about 5 feet tall. This family was followed on the 1870 and 1880 census records. They were living in Hancock County, Tennessee in both years, but they too moved to Kentucky. Brenda Kennedy, a descendent of this line, states that Francis Asbury married Rebecca Shaw. The marriage date is unknown but it appears they married around 1870 – 1872. Their first child, Kissiah, was born about 1872 on the 1880 census of Hancock County. Francis operated a Grist Mill in Hancock County believed to have been the same Grist Mill owned, but sold, very early by his probable grandfather, Nehemiah Hurley, Sr around 1836. Lydia (Scalf) Painter, grandmother of Francis Asbury Hurley, was living in the home of her grandson in 1880 Hancock County, Tennessee. This was the last record found of Lydia (Scalf) Painter. Nancy Hurley, daughter of Martha Painter and Nehemiah “Buck” Hurley was born 1852-1854 in Tennessee. Her birthplace is listed on this census as Kentucky but her parents were living in Hawkins County, TN in 1860 and her birthplace was listed as Tennessee. Nancy married James Bryant (exact marriage date unknown) and was living in Hancock County, TN in 1880. They probably married around 1872-1874 since the first child was born about 1874. Nancy moved to Rim (Bell County) Kentucky by 1910 and is listed as a widow. She died in Louellen (Harlan County) Kentucky February 2, 1937 at the age of 85 years, 8 weeks and 14 days old. Nancy’s death certificate, contributed by Brenda Kennedy states that Nancy was a widow and was born in Tennessee. Her parents were listed as Nehemiah Hurley and Martha Painter. Nancy is buried in Pineville, Kentucky. Her son James Bryant was the informant for this record. This record confirms that Buck and Nehemiah Hurley were one and the same person. The last child’s name appears to be Alafar. This child was the first one born in TN. According to the 1880 census of Hancock County, James and Nancy had lived in Kentucky until shortly before 1879 when the last child was born. Sometime between 1880 and 1892, this couple moved back to Kentucky where James and William were born. Nancy’s mother, Martha Jane (Painter) Hurley was living in the home in 1910. This was the last record found of Martha Jane (Painter) Hurley. James Bryant, son of James Bryant and Nancy Jane (Hurley) Bryant was born about 1893 in Kentucky according to the 1920 census record of Bell County, Kentucky. 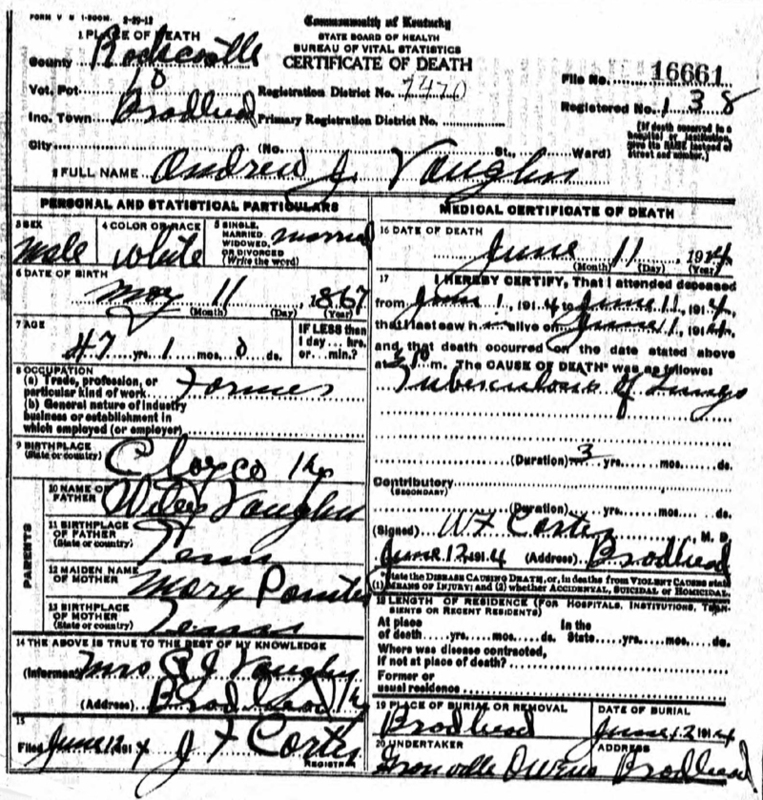 He married Lola (maiden name unknown) and it appears they were recently married in 1920 for there were no children listed in the home. However, his mother, Nancy (Hurley) Bryant was living in the home in 1920. A cousin, Isaac Williams was also in the home. John W. Hurley, the son of Martha Painter and Nehemiah “Buck” Hurley, was born April 1854 in Tennessee. 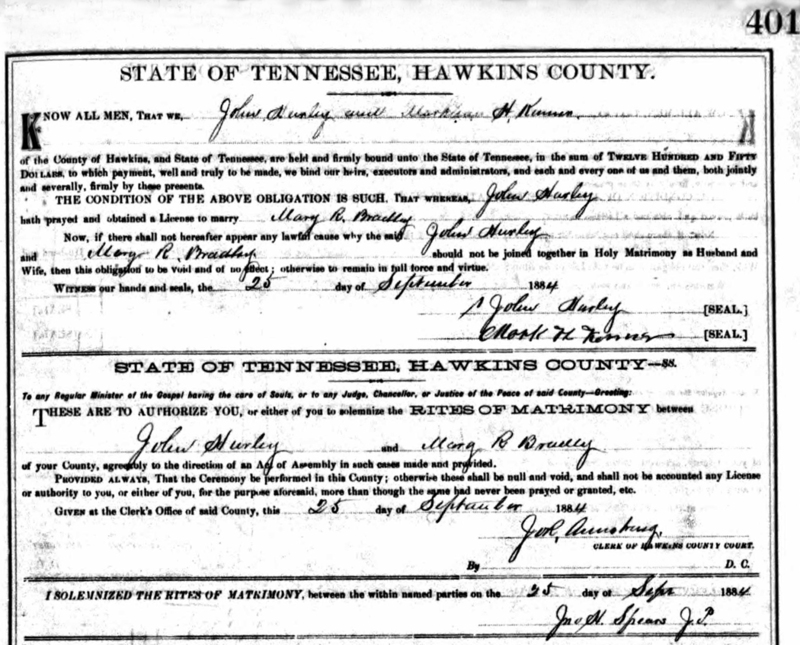 John married Mary R. Bradley on September 25, 1884 in Hawkins County, Tennessee. 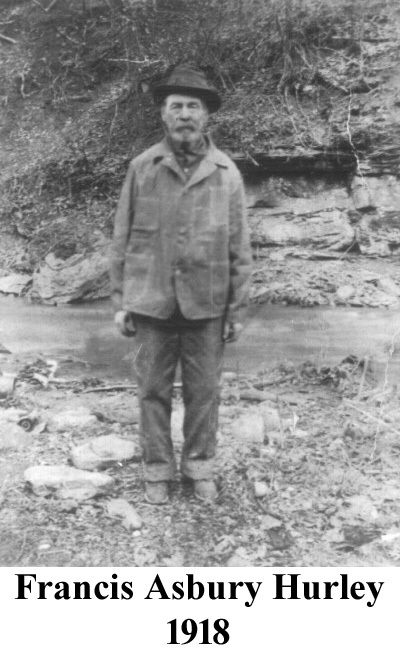 Melvin Hurley, the son of Martha Painter and Nehemiah “Buck” Hurley, was born about 1858 in Tennessee and died September 1897 in Bell County, Kentucky. Melvin married Frances Catherine Manis on October 9, 1879 in Knox County, Kentucky. After Melvin's death , Catherine married (2) Perry Hale on December16, 1899 in Knox County, Kentucky. This marriage did not last very long and Frances was listed as a widow in the 1900 census. Later, Frances married (3)Noah Lockard, the son of Thomas Lockard and Sela Ann Scalf, on June 29, 1904. Noah died July 2, 1911 in Four Mile, Bell, Kentucky. Frances was born about 1861 and died November 1, 1926 in Fayette County, West Virginia. Mary Painter, the daughter of Lydia Scalf and Johnson Painter, was born about 1830. The Johnson Painter household is listed in the 1830 Washington County, Tennessee census with two small girls under five years of age. We have not found other Painter households with two daughters under five years in this area on the 1830 census. We believe Martha and Mary Painter are the names of the two girls in the Johnson Painter household. However, both girls have moved out of the home before the 1850 census was taken which would have given more details on the family members. 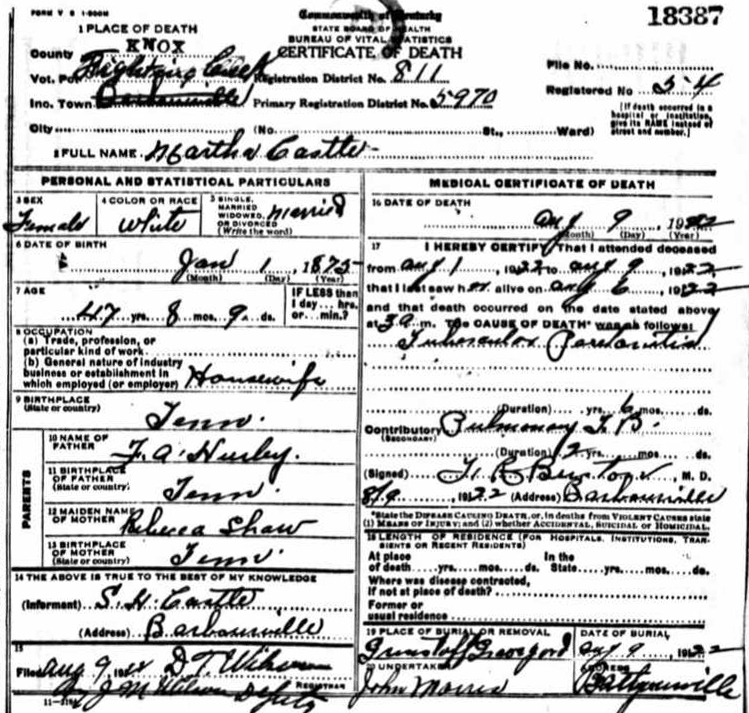 Martha Painter, the daughter of Lydia Scalf and Johnson Painter and the sister of Mary Painter, has a death certificate which identify Johnson Painter and Lydia Scalf as her parents, but at this time, we have not located a death certificate for Mary Painter. Mary Painter married (1) Wiley Vaughn about 1847 and (2) William Benge on November 27, 1870. William Benge died 1871 - 1872 in Clay County, Kentucky. We were able to follow Mary Painter Vaughn Benge on the 1850 - 1880 census records. Andrew Vaughn, the son of Mary Painter & Wiley Vaughn, was born May 11, 1867 in Clay County, Kentucky and died June 11, 1914 in Rockcastle, Kentucky. 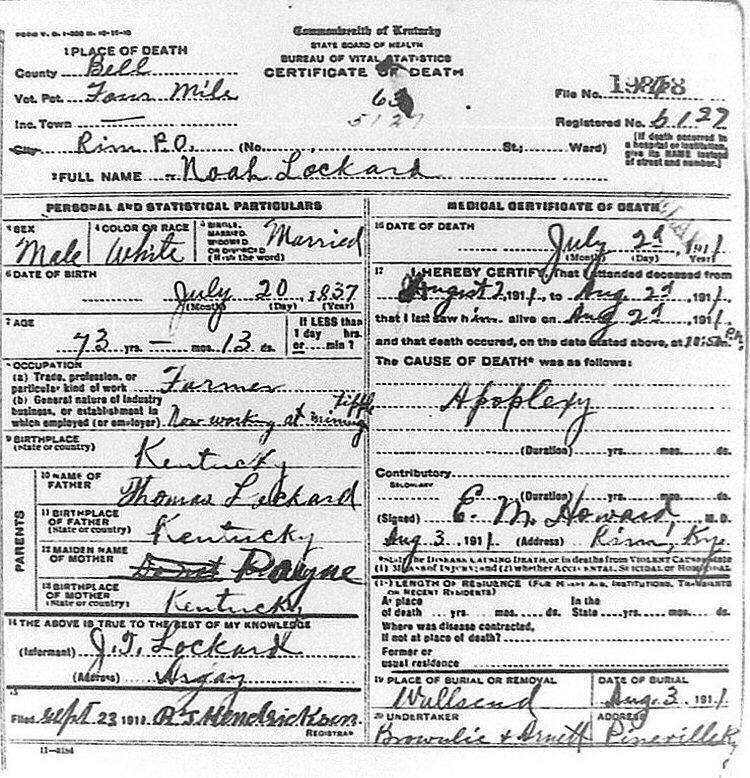 Andrew's death certificate list Wiley Vaughn and Mary Pointer as his parents. Andrew married Martha L. Setser in Clay County, Kentucky on November 11, 1885. Martha was born October 1871 in Bull, Clay County, Kentucky and died about 1930 in Corbin, Kentucky. Thorough searches of the census records for 1840 and 1870 have failed to produce Lydia and/or Johnson Painter. Neither could John W. Painter, son of Lydia and Johnson be found after 1850. Not many descendents of this line of the family are known; however, research continues and we hope to hear from some of these descendents. Additions will be added as information is received. Copyright (C) 2005 - 2017 by Margaret Fleenor, All Rights Reserved.